When I first started reading Yann Martel’s Booker prize winning novel, Life of Pi, I left it after a few chapters. It was slow and the author spent a lot of time describing the young protagonist’s religious and spiritual discoveries. I re-visited the book after a few years and it was different this time. I was patient initially but then the book started working its magic… Pi’s unbelievable journey became most believable and I connected emotionally with the 13-year old boy and his sole companion on a life-boat, a royal Bengal tiger called Richard Parker. The book was called un-filmable not only because of the technical challenges but because the way the story plays out; there are large portions where nothing significant happens and how do you keep expressing what a boy is feeling. However, master filmmaker, Ang Lee brought it alive on the big screen and in a way one couldn’t imagine. Life of Pi is not only visually stunning but is a deeply moving film that despite all the technical wizardry is far from the usual holiday blockbusters. For those not aware of the story, Life of Pi is about a 13-year old Indian boy, Piscine Molitor Patel aka Pi, from Pondicherry (now Puducherry) who is born a Hindu but is also Muslim and Christian. He believes in God and sees a kind soul in everyone… even wild animals. He loses his family in a ship-wreck and finds himself in a lifeboat with some cargo from his father’s zoo – a zebra, an orangutan, a hyena and a tiger. The rest of the story is about his amazing journey, survival and faith in God. David Magee has successfully adapted the novel into a balanced screenplay that does not let the first part of the book slow down the film but still lets us relate to Pi’s belief system. Lee keeps things simple without over-doing the emotions. He does however uses special effects and 3D to create a magical setting that invites you to get lost in the middle of the ocean like Pi. Claudio Miranda’s cinematography is stunning – from the opening sequence in the zoo to the calmness of the ocean, this is the best looking film since Martin Scorsese’s Hugo last year. Michael Danna’s background score is beautiful and reminds you a bit about his earlier Indian outings like Monsoon Wedding and Water. Among the actors, Suraj Sharma as Pi has done a fine job for a debutant and shows great promise as an actor. Tabu as Pi’s mother is as graceful as ever but I wish she had a few more scenes. Like her, other actors including Gérard Depardieu, Adil Hussain, Rafe Spall and Irrfan Khan have small roles but all just right. The real star of the film however is Richard Parker, the computer generated tiger. He is so real, so majestic and so beautiful; like Pi, you develop a bond with him and feel disappointed with his indifference. 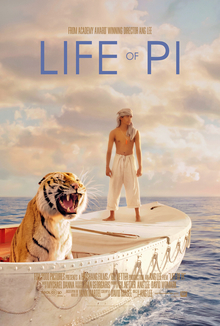 Life of Pi is not a crowd pleaser but is a cinema lover’s delight, just like Hugo. Some people are not happy with the film’s end but I wonder what else Ang Lee could have done? Those who have read the book may find the end more agreeable than those who haven’t in my opinion. There is a question at the end of the film… ask yourself that, see what answer you get and you’ll know if the film worked for you or not.